By registering and participating in this auction, the bidder/buyer agrees to the following TERMS AND CONDITIONS: BUYER'S PREMIUM: For Internet Bidders Only a buyer's premium of two percent (2%), not to exceed $495 per lot purchased will be added to the high bid to determine the final selling price for the auction lot. Example: $1000.00 Bid + 2% BP = $1,020.00 Final Selling Price. Onsite bidders will pay no buyers premium.DISCLAIMER: All lots sell as is, where is, with all faults. 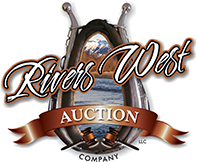 Rivers West Auction, LLC (RWA) and the seller do not give or make any type of guarantee or warranty regarding the lots to be sold, implied or otherwise. RWA encourages all bidders to inspect lots in person before bidding. RWA is not responsible for incorrect listing information, if any. RWA has attempted to provide accurate descriptions of all items, however, it is the bidder's responsibility to determine the condition and suitability of each lot. Printed statements or descriptions by RWA are provided in good faith and are matters of opinion. RWA and its employees act merely as agents for sellers. While the information we provide on item(s) is deemed correct, no warranties are expressed or implied as to any items being sold and you agree to purchase and accept the item in an as-is condition. Information on items is obtained by us from the sellers and you hereby agree to hold harmless RWA and their employees for any errors or omissions regarding the item(s) being sold. This information includes but is not limited to year, model, machine or engine hours, physical condition, options, features and other data pertinent to the value of the item. NO RESERVE: All lots will sell to the highest bidder without reserve. Only the top bidder will be contacted as to the status of his/her bid. ALL ITEMS ARE SOLD AS-IS WHERE-IS: All items are sold "As-Is Where-Is" unless specific factory or seller issued warranties are listed in the item description. PAYMENT: Onsite bidders must pay for all items purchased at close of auction. Internet bidder must have all items purchased, paid for by 5PM Tuesday, July 31, 2018. Email Reed at [email protected] for payment and/or wire transfer information/questions. No item may be picked up until payment is received by RWA. Merchandise becomes the full responsibility of the buyer at time of purchase and the buyer assumes all risk of loss and damage to property at that time. RWA reserves the right to resell any property not paid for in full by 5PM MDT on Tuesday, July 31, 2018. In any such event, the Buyer will still be responsible for payment for the original purchase and the costs of collection of this payment and/or damages resulting from the resale of the property. SHIPPING: RWA or Seller will NOT provide shipping for items purchased through this auction. For shipping quotes please contact, Eldee Roundy at 406-360-0958 an independent freight broker.PICKUP: Pickup and Loadout is scheduled for post auction on sale day July 27th, 2018.DEBT COLLECTION AND COLLECTION CHARGES: The buyer agrees to pay all reasonable attorney fees and other costs incurred by RWA in its efforts to collect unpaid funds due from the buyer under this agreement, regardless of whether or not a civil suit is actually commenced. The buyer agrees that a fee of 2% of the outstanding balance per month be added to any unpaid balance due RWA. Buyer also authorizes RWA to debit their credit card placed on file by buyer with RWA for any past due amounts owing by buyer under this agreement. The buyer expressly stipulates that this agreement shall be exclusively governed by and construed in accordance with the laws of the State of Montana of the United States of America to the exclusion of any other law or conflicts of law principal that might otherwise apply to the law of any other jurisdiction. Exclusive jurisdiction and venue for any dispute, controversy or claim arising out of or in connection with this agreement shall only be placed in the Federal or State Court with competent jurisdiction located in Polson, Montana. In this regard, the parties consent to the exercise of personal jurisdiction by said courts in any such action. LIMITATION OF LIABILITY: If for any reason, RWA is unable to make available or deliver any Purchase, or portion thereof, or documentation required in respect of any Purchase, the sole liability of RWA, if any, shall be the return of monies paid in respect of such Purchase upon its return by Purchaser. AGE REQUIREMENT: All bidders must be 18 years of age or older. BIDDER INFORMATION & SECURITY: All registration information the bidder provides to RWA shall be current, complete, and accurate. All bidders are responsible for any bids placed under their bidding numbers and passwords. The security of bidder information is the responsibility of the bidder. Bidders must notify RWA if they believe that their bidder number and password have been compromised. THE ONLINE WEBCAST AUCTION WILL BE CONTROLLED BY BIDCALLER: The Auctioneer is not responsible for malfunctions or system errors which cause a bid or bidder to fail to be recognized or registered. If there is a dispute, the Auctioneer may re-open the bidding at the Auctioneer's sole discretion and shall serve as the sole arbiter as to who is or is not allowed to bid. The Auctioneer reserves the right to group, add to, delete, withdraw, consolidate or break down properties or quantities offered, to sell out of scheduled sequence, to reject any bid which is only a fraction advance over the preceding bid, to regulate bidding and to accept or reject any or all bids. Absentee bids may be accepted at the discretion of the Auctioneer. Any and all decisions of the Auctioneer regarding the order and conduct of the auction shall be final and absolute without liability to any party. Seller reserves the right to cancel or withdraw any property at any time.